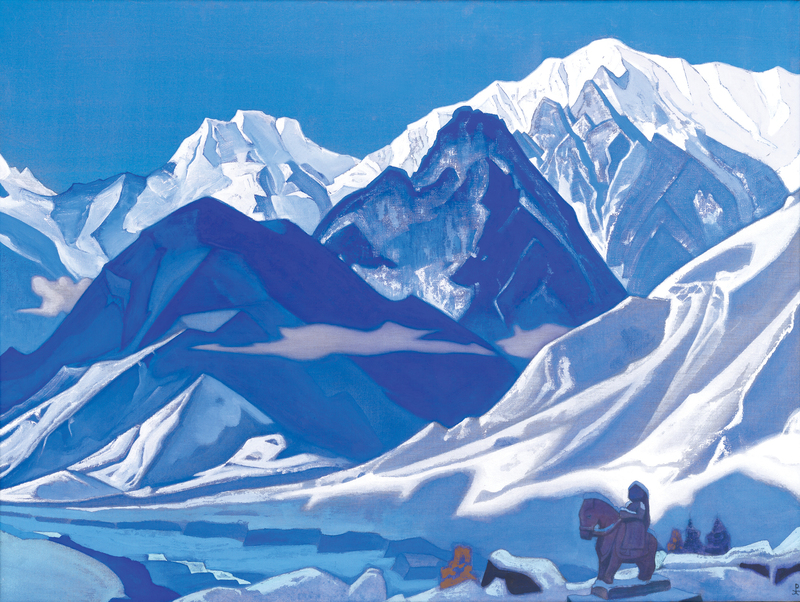 Nicholas Roerich’s (1874–1947) name is known around the world. The graduate of the Saint Petersburg Imperial Academy of Art was one of the leaders of the World of Art movement that shook the art scene in Russia. The author of historic paintings, theatre designer, pedagogue, philosopher, scientist and traveller, like many of the most renowned artists of the Age of Silver, was forced to emigrate. He lived in Finland, Sweden, Great Britain, France and the United States. However, his dream and life’s mission was Central Asia with its unique culture, discovered during expeditions in Tibet, India, China, Mongolia, Siberia and Japan, along with complex cultural studies of these countries. Yet wherever he happened to be, Roerich never lost touch with the land of his ancestors, Latvia. Almost all of the exhibits of this show have come precisely from there, specifically paintings from the Latvian National Museum of Art and the Riga Bourse Art Museum, books and archival documents from the Latvian Roerich Society, and his forefathers’ works of art from the Liepāja Museum. Several exhibits from the Lithuanian Art Museum and the Lithuanian National Martynas Mažvydas Library reflect Roerich’s connection to Lithuania. The exhibition consists of four parts: the paintings of Nicholas and his son Svetoslav, exhibits from the Latvian Roerich Society, material from the Liepāja Museum about Roerich’s links to Latvia and Latvian artists, Roerich’s colleagues from the Academy of Art and his Latvian students living in Saint Petersburg. Yet probably the most important aspect of this exhibition would be, of course, the artist’s own specially selected paintings sent to Latvia from India in 1937. The package from the Kullu Valley in the Western Himalayas was dedicated to the Latvian Roerich Society. In the prewar years, the Latvian Roerich Society that had been established in Riga displayed a painting exhibition featuring works by Nicholas and Svetoslav, later contributing to the Baltic Art section. From 1930, for a decade its members carefully assembled a collection of archival documents, books and photographs. But in 1940 the Soviet government dismantled Roerich Societies both in Lithuania and Poland, and it was not long before their members experienced repressions. In 1950, the collections found their way to the present-day Latvian National Museum of Art and are part of the Riga Bourse Art Museum’s permanent exhibition. Aside from the paintings of Nicholas and Svetoslav Roerich, on show here are also works by famous Latvian painters and graphic artists. Whilst studying in Saint Petersburg, Roerich was friends with Vilhelms Purvītis, Janis Rozentāls and Johans Valters. Representatives of the younger generation of Latvian artists, such as Niklāvs Strunke, Kārlis Miesnieks, Jānis Plase and the world-famous graphics master Gustavs Klucis, attended the drawing school of the Imperial Society for the Encouragement of the Arts, headed by Roerich. This is the fifth exhibition of work by Nicholas Roerich to be held at the Lithuanian Art Museum. At the end of 1975 and in early 1976, an exhibition of paintings by this artist was organised at the Vilnius Town Hall. 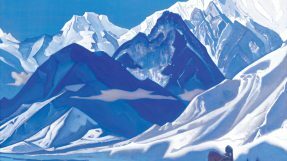 In 1992 his painting exhibition Himalayas was displayed at the Lithuanian Art Museum’s Klaipėda Picture Gallery (now the Pranas Domšaitis Gallery), while in 1999 a show of Nicholas and Svetoslav Roerich’s reproductions was opened at the same art space. It was organised by the Lithuanian Roerich Society. And in 2004, an exhibition of paintings by Nicholas and Svetoslav Roerich was held at the Pranas Domšaitis Gallery.